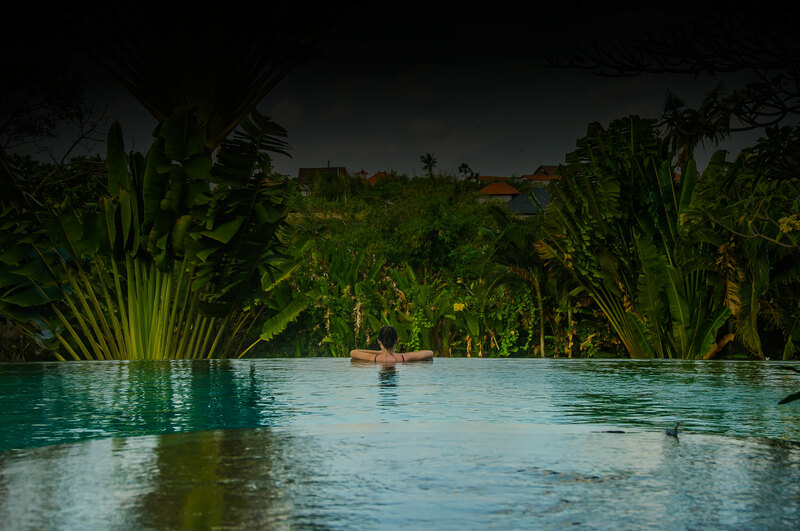 Your authentic Bali tropical get-away. Taking tropical holiday experiences to the next level is a Colony trademark. Welcome to our enormous 3000sqm one of a kind resort style private villa compound perfectly located minutes from the beach and a short hop into Seminyak. From a family-friendly enclave to a superb event and wedding venue we are well versed catering to any guests expectations and requirements. Recently acquired by the Australian based Marine 1 event and charter boat company, Colony is refined yet relaxed, with an abundance of open space. Centred around a sparkling deep water pool that enjoys sunshine all day, we offer 5 separate bungalows set within sprawling tropical gardens and lawns, sleeping up to 14 guests. After our upgrade in early 2019 we look forward to welcoming groups of up to 26 guests in size. Colony Canggu Bali currently features 5 spacious guest rooms, each with a queen size double bed with four of the rooms having additional fold out beds, providing space for up to 14 guests. 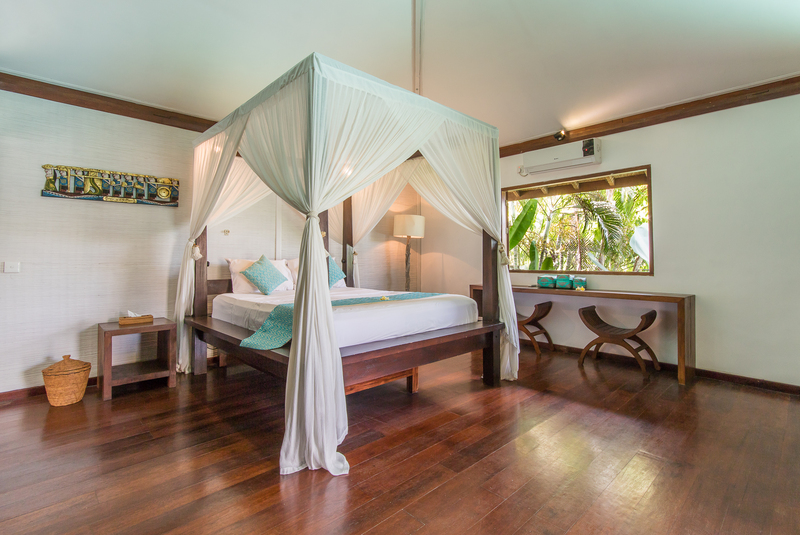 Bungalows 1-3 have private en-suite tropical semi-outdoor bathrooms, while bungalow 4 shares its bathroom with 2 rooms. Our rooms are stylish and simply furnished and fully air-conditioned. Our guest capacity will increase to 26 after our early 2019 upgrade, with 7 or 8 double rooms and an 8 person bunk room. 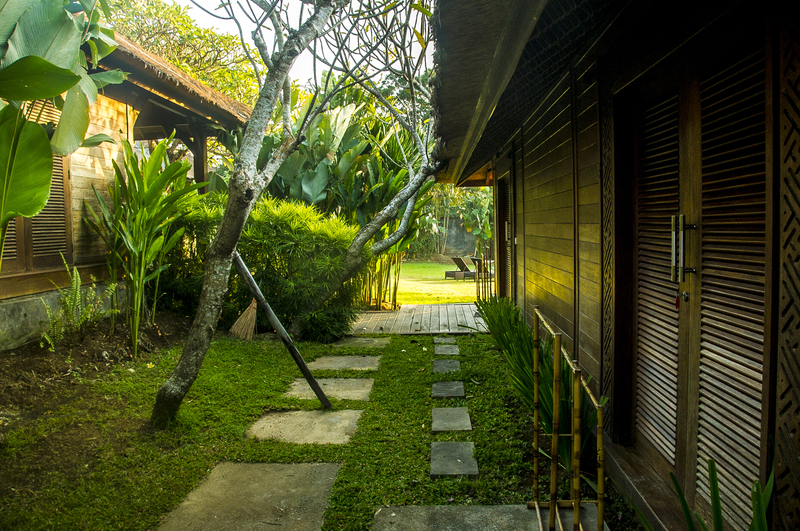 Located next to a rice field and set back from the main road, and with hotel grade mattresses and linen, you can be assured of a restful nights sleep to end yet another perfect Bali day. Flick a switch and Colony enters night mode. 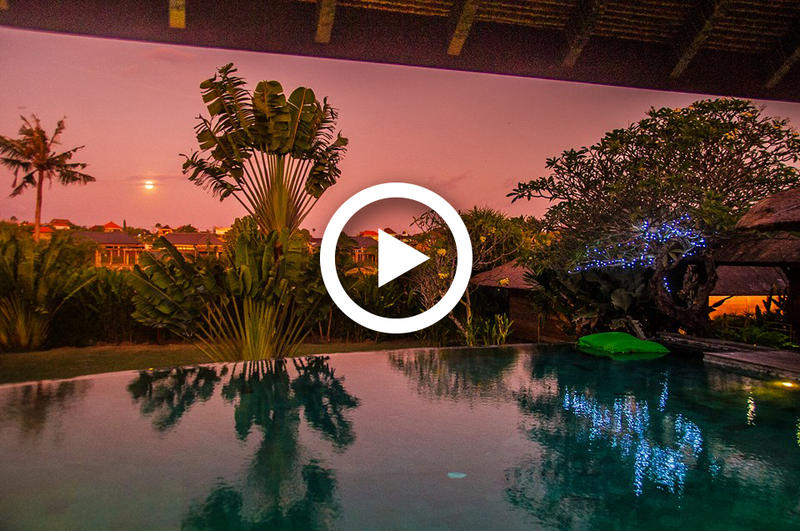 A new JBL sound system and gorgeous ambient lighting sets the scene for an in-villa celebration to mark a milestone event, or a warm up before hitting the beach clubs and bars of Canggu or Seminyak. Don’t forget your USB, Spotify or Iphone, or kick back and enjoy the Villa’s soundtrack curated across genres by award winning Bali based DJ’s Sophie Visser and Jason Stone. 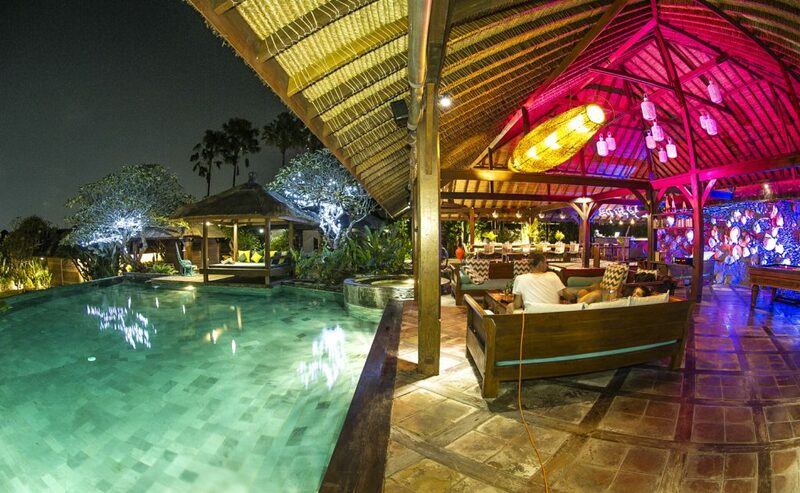 Picture yourself at Colony Canggu. 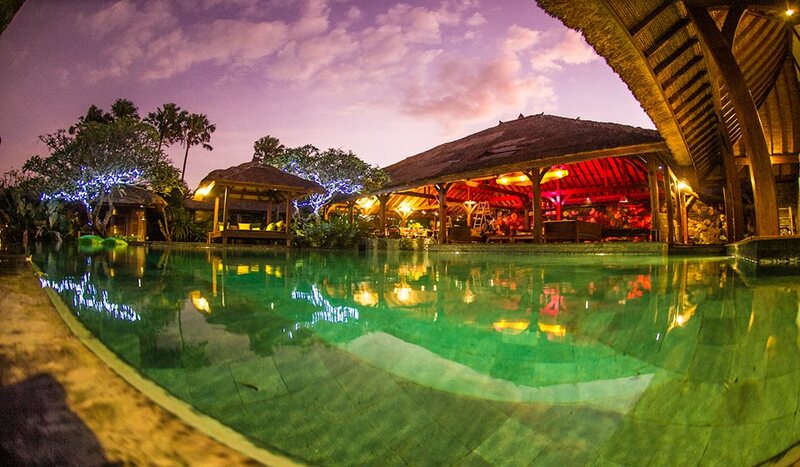 Our tropical oasis in sunny Bali is nothing short of stunning. But don’t take our word for it; take our video tour. Because seeing is believing. Rates include tax and service charge, airport transfers and breakfast on morning of arrival. Daily turn down service and villa cleaning, complimentary bottled water in rooms and purified water in living areas, unlimited free wifi, drinks and groceries shopping service, guest assistant services from 8am – 8pm, 24 hour manned security post, digital safe in each room, welcome drink and cool towel upon arrival. Maximum guests 14 before March 01, 2019, 26 guests after March 01, 2019. Additional breakfasts: enjoy the myriad local cafes or our staff will purchase groceries at your expense on your behalf and prepare and serve for you at no additional cost. Additional services: Private vehicle and driver AUD$60 per day (8hrs), scooter hire from $5 per day, spa and massage treatments on site from $15 per hour. Nightly chef from $30 per sitting. voted No 1 destination in the world by Trip Advisor in 2017.